Bout of Books … I’m in! So I didn’t participate in the Read-a-Thon. Honestly, that kind of stuff just isn’t for me. 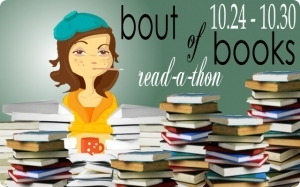 However, I kept seeing the Bout of Books and didn’t really know what it was about. But when I read about it, I was intrigued. It seems like a more laid back event that I could participate in easily. So I’m signing up. I have yet to decide how I will be keeping track of what I read this coming week. Whether I will post individual daily posts to update my reading or if I will keep it all in one sticky post. But you will obviously be seeing daily updates. Oh and I will also be updating as I can on Twitter too, so find me there (@tarataylor7585). That’s all I’ve got for right now. I look forward to participating and happy reading!! !